Helps multinationals save money, time, and reduce volatility by efficiently and accurately consolidating global data in real-time,empowering better foreign exchange hedging decisions. As a $1.4 billion global company doing business in 30 countries, we have FX exposures all over the place. Whitewater is an easy-to-use, easy-to-implement FX exposure consolidation tool that did not require the IT resources that other tools do. 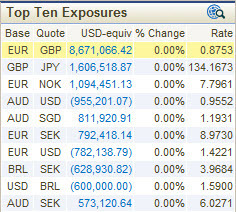 To learn more and to use our FX exposure calculator to illustrate the P&L impact of currency volatility, go to http://www.WhitewaterAnalytics.com. Whitewater Analytics provides best practice software solutions to multinational corporations seeking to better measure their currency exchange risk. Built on the experience of corporate treasury professionals, WHITEWATER ANALYTICS provides corporate treasury risk managers with the information they need to make timely, accurate, and informed hedging decisions, helping them to reduce volatility and save money. WHITEWATER ANALYTICS BrochureMore information about the FX Management solution.